(4 years later) Dear Stack Exchange: can we change our site name? Four years ago we asked for a name change, which was rejected by SE because there was no evidence to support the claim it was causing user confusion, and there were other things the site should focus on first. The subject of the site's name still keeps coming up time and again from both new and veteran users. The solution to the vast majority of bad content that I speak of is Our Domain Name. It is as simple as that. Change the domain name of the site from Programmers to Software Engineering and Architecture or something akin to this and I will personally step down as a moderator if spam on the site doesn't cut by half. I don't think anyone -- other than SE itself -- disagrees that the site is poorly named. However... that is well outside our ability to influence. Is this site poorly named? Are people coming to "programmers.stackexchange.com" and immediately thinking "aha, the place for my programming questions! they will help me debug my code!" I've never really understood why the site was called "Programmers.SE"... we're all programmers, aren't we? Pretty much the same over at SO... so from a newb's perspective, what's the difference? I could keep going if you want, but those are just some comments from recent posts. There are many more of them if you keep looking further back. So please Stack Exchange, can we get your permission to change the name of our site? It doesn't need to be a complete re-design, just a domain name change and a title. Oct. 20th, 2016 - This is done! It took us a good while, but the Community Team has circled up and here's where we stand on your request to change Programmers.SE's name. We agree that renaming this site is a good idea. "Programmers" is an affinity group, whereas "Software Architecture" (for example) is an action and a discipline. It is entirely possible that changing the site's name will send clearer signals and prime new users to ask questions more consistently in line with what y'all would be proud to see and answer, particularly given where this site’s scope has solidified over the past few years. So yes, we're open to proceeding with a name change. That said, we'll need to make sure the change makes the kind of difference you want it to, because we can't repeat this process again several years down the line. We gotta get it right this time. Last time the site was renamed, the scope was very much still in flux; by now, hopefully you can identify much more precisely what this site is about and commit to both a name and description and introductory materials that communicate this body of knowledge clearly and succinctly. Tell us what you're proposing as the new site name. "Software Engineering" and "Software Architecture" both look like good options from where I stand. Let’s not turn this into a bikeshed discussion; we need well-considered options here, not a popularity contest - Coffee McWhiskeyface is right out. The ideal name will suggest at a glance what this site is about, without suggesting that it might be “fix my code” even a little bit. Lay out what the new site scope will be. Above all else, the scope needs to be simple. Seriously. No more than four bullets, no multi-line comma-separated lists, no gerrymandering - it needs to be easy for any new visitor who bothers to read and even mildly pays attention to what they're reading to know what they can and cannot ask about here. Eliminate ambiguity for a first time poster once and for all. Let's talk again in a month. I think it's a valid to request to find out if this option is even feasible. There have been a number of conversations lately, including with SE Community Managers, that have revolved around the site's scope and focus. I think it's safely stated that the current site name does not give a correct first impression for the site's scope. I've noticed a lot of discussion on this issue, and as a new user I feel I can shed some light as I have previously had difficulty when trying to decide whether a question I have, does in fact fit the sites scope. It is a well known fact that when most people 'Sign Up' for things on the internet, they don't feel like reading the basics until they're in. Would it be too much to add a reminder here? Am I missing something, or do others share my view that if, to the right of my 'Ask Question' form is a message which asks, 'Is your question about software development?' then I can ask debugging questions, library recommendations, conceptual questions, database questions, and pretty much everything else which we as 'Software Developers' deal with on a day to day basis. Why can't the more clear description of the sites scope on the 'Sign Up' page be repeated in at least the 'Ask Question' page? IMO a name change is way overkill. to find a name which really describes the sites scope better, and not just different or equally bad (or worse). once the name is changed, there is probably no easy way back for the next few years. A site name change is something I do not expect the SE team to make every two weeks. So if the change does not bring the benefits we expect from it, what then? If we could just try out if a name like "SoftwareDesign.SE" (or "Programmer's Whiteboard", a older suggestion of Robert Harvey which would be my favorite) would increase the ratio of "good vs. bad posts", I think no one here would hesitate to do this. But such a change has a high risk of collateral damage - one has to be very sure about that it is worth the hassle. For me, it looks your proposal for a name change is trying to solve a problem which might be better addressed differently. This post two days ago and its topmost answer reveals where the real problem is - not the site's name has to change, but the way how some people (and I don't exclude myself from this) behave in the process of closing, replying to bad questions and commenting. Don't get me wrong, I am not against a name change, but whoever will do this, please do it with care. And do not be too astonished if the number of low quality question does not drop significantly after the change. It would be a good idea but if I remember correctly the primary reason against this happening is that this would significantly hurt SEO. This however can be a PITA, but it is not the insurmountable challenge that the StackExchange folks make it seem. Notify Google, Bing et al. 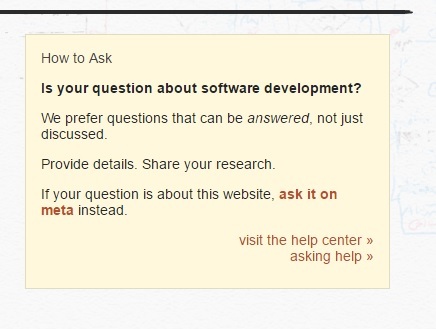 In the How To Ask it says, "Is your question about software development?" That seems like a pretty good name. The Tour, has a list of questions not to ask. New posters are not reading this list. Many items are straight-forward. general workplace issues, career advice, job hunting, salary, or compensation -- The name Programmers contributes to this problem. implementation issues and coding tools -- A name change, at least the ones suggested, isn't going to fix this one especially coding tools. what you should learn next -- The name Programmers contributes to this one. what projects to do or books to read -- Name change won't fix this either. where to find libraries, tools, resources, or other product/service recommendations -- Read the Instructions, name change won't help. personal lifestyle or non-programming activities -- Changing the name could help this one. Maybe we should change the name to "Read the Instructions"
SoftwareEngineering.SE : hmm, probably we'd end up with more implementation questions, and get confused with some official Engineering qualification or certification stuff, and chances are we'd still get "fix my codez" questions anyway! SoftwareDesign.SE : more likely to start getting a load of graphic design issues. And still, even if its pointed out to be software design, then implementation questions along the lines of "what's wrong with this design" rather than "what's wrong with this code". SoftwareArchitecture.SE : This is more obvious its about figuring out how software should be structured. My concern is that this would be too constrictive, getting overly broad architectural questions that could still be better answers on SO. It might also discourage questions about software development practices or algorithms (which I'd say fall into this 'Programmers' bucket). DevOps.SE : maybe too focussed on tools and not design, but getting away from the word "software" or "programmers" might be what we need to start thinking of. Well if you are going to change the stack name to reflect a conceptual or theoretical basis for questions that would surely invite questions which are conceptual or theoretical. Conceptual or theoretical questions are half a step away from open-ended or opinion based answers, which are unpalatable to any stack. software design would be a more accurate stack description (as opposed to "programmers" which is a poor choice of title in multiple ways). But software design would tend towards answers that are best guesses, predictions, and hypotheses. Sure, these things can be backed up by evidence, but they are not definitive answers, surely, and must be frowned upon? Besides which, insofar that software development can be answered here, it can equally be answered in StackOverflow, which has a far greater volume of users (can't guess why). Programmers Stack Exchange is a question and answer site for professional programmers interested in conceptual questions about software development. It's 100% free. What's your software development question? Be specific. Is your question about software development? 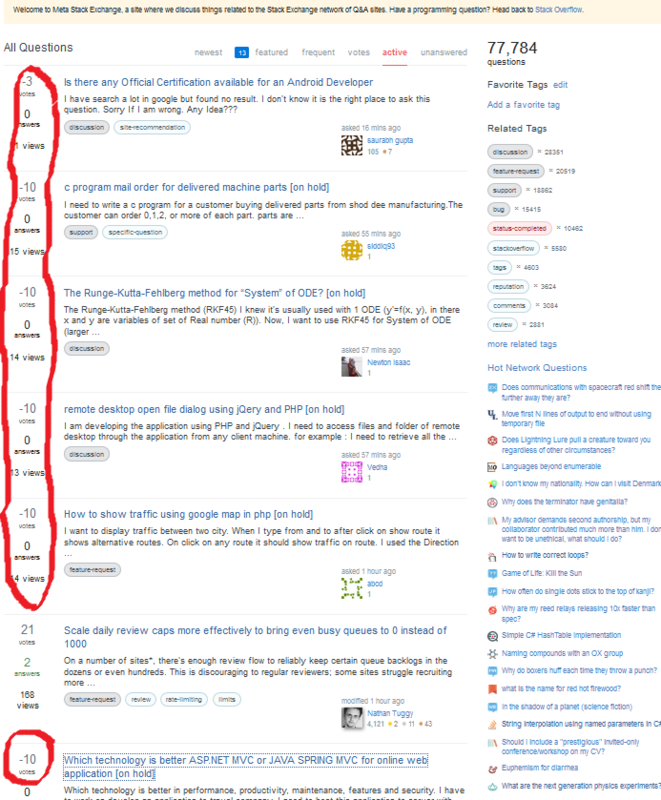 So what's wrong with Software Development Stack Exchange? Create a new site (softwareengineering.se), let on topic migrate, losen restrictions on programmers.se to be open for programmer/programming questions. SE could be moderated to fit software engineering while programming could be moderated to fit programming programming topics. Looks pretty valid to me. Knowing the history of NPR-to-Programmers, programmers is quite a candidate-for-worst-name at the moment. Maybe a NotProgrammingButConceptRelated name could be fine. Of course, it should not be switched back to NotProgrammingRelated. There is already CodeReview.SE for questions about already written code so perhaps there could be CodeGuide.SE for questions about how to write a piece of good one. Not the answer you're looking for? Browse other questions tagged feature-request status-completed site-attributes new-site-name . I'm not a software engineer, right? Can we remove “programming puzzles” from appropriate questions to ask on Programmers? New Site Name and Scope Proposals: what happens to the hyperlinks?